Added Page 25 today. Ald and Blaise continue their discussion of Blaise’s “loan.” I love what Brittany did with the two children building the snowman in the background. Convention season is fast approaching. Brittany and I will be attending Balticon over Memorial Day weekend (May 27-30), where we will have a table in Artists’ Alley. We will have a number of new items for sale, including our introductory book — and buttons! In addition, we’ll be part of a panel on Friday night to discuss “Making a Graphic Novel Webcomic” along with Jennifer Zyren Smith of LaSalle’s Legacy and Barb Fischer of Sledgebunny. Make plans to come see us! 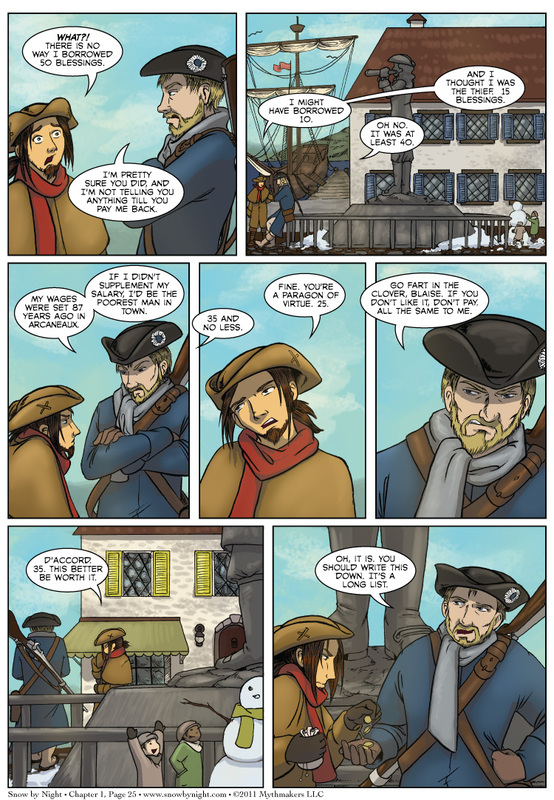 Lastly, I’ve uploaded a preview of Page 26 as an incentive on Top Web Comics. Please vote for Snow by Night. Love the comic though, keep it coming. Try emptying your cache. Page 25 is saved as Current so it should pop right up. The direct link is http://www.snowbynight.com/pages/en/current.html. This comic is so awesome, you guys.